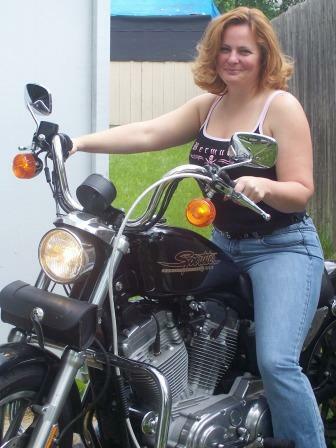 I had a motorcycle permit, all my riding gear and a new to me Harley-Davidson® motorcycle. I had to ride it, even if I didn’t know how! My townhouse was near an elementary school. I just needed to get around the corner to the entrance and then I could ride in circles around the parking lot. I would never even have to shift out of first gear. It was the perfect plan. I figured the clutch worked the same way as in my car – give it a little gas, ease out the clutch, give a little, go a little. And it did work that way heading up the slight incline on my road. When I got to the stop sign I needed to make a left onto the street, so I waited until there was no traffic anywhere near before I started to go. Gave it a little throttle and let the clutch out a bit. I was headed slightly downhill at this point though, so apparently I really didn’t need to throttle at all! The bike shot out forward and was halfway across the street before I could blink! I now had only half the space to make the turn…and I almost made it. My bike came to its intended forward direction about two millimeters away from the curb. So I rolled along with the side of my tire scraping against the side of the curb for about 5 feet before the bike decided it didn’t like that and fell over. My crash bar filleted the grass and sliced up a nice piece of sod. I scratched the shiny chrome on my pipes, tore a small chunk from the toe of one boot, and got bruises on my elbow and hip. Before I could even refocus, a man in a pick-up truck stopped and helped me pick up the bike. He made sure I was OK, then drove off. I knew I needed to put the bike away, but then it wouldn’t start up again…so I had to duck-walk it back down the block and into my house. I learned a valuable lesson that day: respect the machine! After that, Jay drove down from Delaware to Baltimore once a week after he got out of work. He took my bike over to the school parking lot for me, and watched while I rode around in circles for hours on end. By the time I showed up to the Basic Rider class, I could shift comfortably between first & second gears and could make a GIANT figure-8 in the parking lot. That made the first morning on the range a piece of cake. It was ungodly hot that last week of August, but somehow we managed to make it through the two day MSF basic rider class at Cecil Community College without getting heat stroke. We quizzed each other at the swimming pool in the evening and until we fell asleep that night. Jay scored 85% on his written exam and aced the skills tests. I aced the written exam and scored 85% on my skills tests. It was like a match made in heaven. We both received our motorcycle endorsement! * This article first appeared in print in the January issue of Fast Lane Biker Delamarva and is the fith in an ongoing series of articles by Diana Green. Summer was flying by and I couldn’t wait for my Basic Rider class to start. How cool was it that Jay & I would be taking it together? I didn’t even know he had wanted to take the class…he already knew how to ride. But I guess it was an easy route to getting his endorsement, so why question a good thing? I read the manual they sent me in the mail, and took all of the chapter quizzes. Some of it was completely foreign to me, so I asked Jay to explain it to me. I ordered 2 jackets from HotLeathers.com, and Jay took me to Freedom Cycle in north Wilmington for some other gear. I bought a DOT shorty helmet, some really cute gloves with studs all around the cuffs, and a pair of riding boots which miraculously fit my extra-wide feet. I couldn’t find a pair of glasses that fit my face right. They were either too big for my face, or they didn’t sit right on my cheekbones, or my long eyelashes would brush up against the lenses and annoy me. I finally found a perfect pair at Mike’s Famous Harley-Davidson in New Castle. They cost almost as much as my 2 jackets combined, but you just can’t argue with a perfect fit! My course preparations also included searching for a cheap used bike that I could crash up and no one would care. I was spending an afternoon on eBay to scope out what might be available and how much it would run me, when across my monitor appeared the most beautiful sight! It was a 2001 XLH883 (whatever that meant), shiny black with sparkling chrome all over. The bike was offered for sale by American Classic Motors in Zieglerville PA, and had a Buy-It-Now price of $4995. I couldn’t believe that anyone could own a Harley® for 4 years and only put 941 miles on it…but that was their loss and my gain! The weekend came and it was time for the adventure to begin! On Friday I rented a cargo van from home and drove it up to Jay’s apartment in Elkton MD. We got up at the crack of dawn Saturday morning with our maps & directions to find American Classic Motors. The guys there were very helpful in loading my little bike up inside the van with lots of tie-downs to keep it secure. When Jay headed off to work on Saturday night, I drove the van back to my townhouse in Reisterstown MD where it sat until the next day. I had to get my brother and a couple of his friends to help get my bike down out of the van on Sunday. (This was a much more difficult proposition than loading it had been, since we didn’t have any kind of a ramp.) It was kind of surreal as four young guys and I pushed the bike around the house and in through the sliding glass door in the basement. No one knew how to ride it, or even how to start it, but it belonged to ME! The next day I returned the cargo van, went directly to the MVA, got tags & a learner’s permit, and came home to ride my bike! * This article first appeared in print in the December issue of Fast Lane Biker Delamarva and is the fourth in an ongoing series of articles by Diana Green. The February East Coast Biker Online is now available. I have an article about my visit to the Barber Vintage Motorsports Museum on page 40. I have a book review of The Original Wild Ones on page 50. Diana has a new never before published article on page 52 titled Ride Your Own Ride. Click here.